For too long I have been stifled by Melly’s need to control my movements when we are out and about. Have you seen what she has done to me? Two harnesses! TWO!!!! And they didn’t even match! 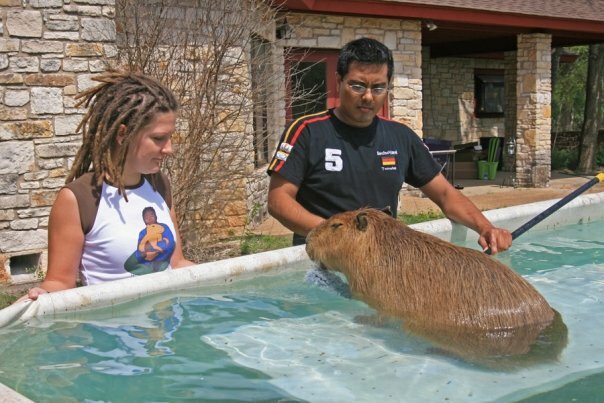 How can a capybara even be seen in public dressed like that? So I was pretty excited when Melly and I picked out this new harness for me at PetCo on Saturday. I think the purple color brings out my eyes. I got a new leash when I got my new harness. The leash is just like my old one. It is for 110 lb dogs and 26 feet long. I wish they came in 100 feet long! And purple. But this type only comes in blue, apparently. Even though it was just like my old one, I had to mark it with my morillo. Actually, I would have marked my old one with my morillo anyway. 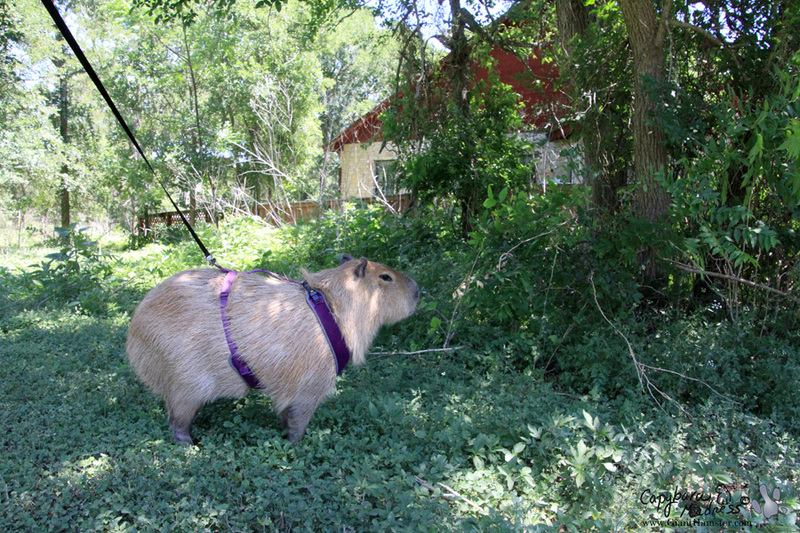 To try out my new harness, we decided to take a trip around the house. Even though we haven’t had much rain, a lot of stuff has grown up. Melly says they are weeds. I say they are camouflage. You never know when a jaguar might be sneaking up on you. Best to keep to the thick brush. This is what the far side of the house looks like. I call this the far side because the gate into the yard is on the opposite side. It is like a jungle out here, even though Melly has been mowing it so it’s not quite as jungley as last year. I wonder what will happen if I go through that underbrush? 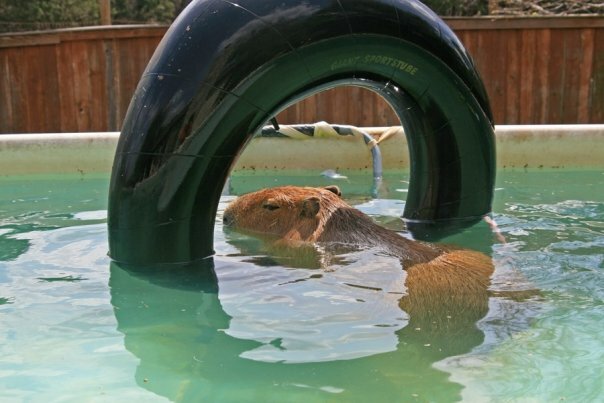 It’s a very capybara thing to do. Eat your heart out, Dobby Winnick! Before I risk damaging my new harness, I want to make sure everyone sees how adorably cute I am in it. The royal purple color really becomes my station in the hierarchy of rodents. I must say, I look totally regal. 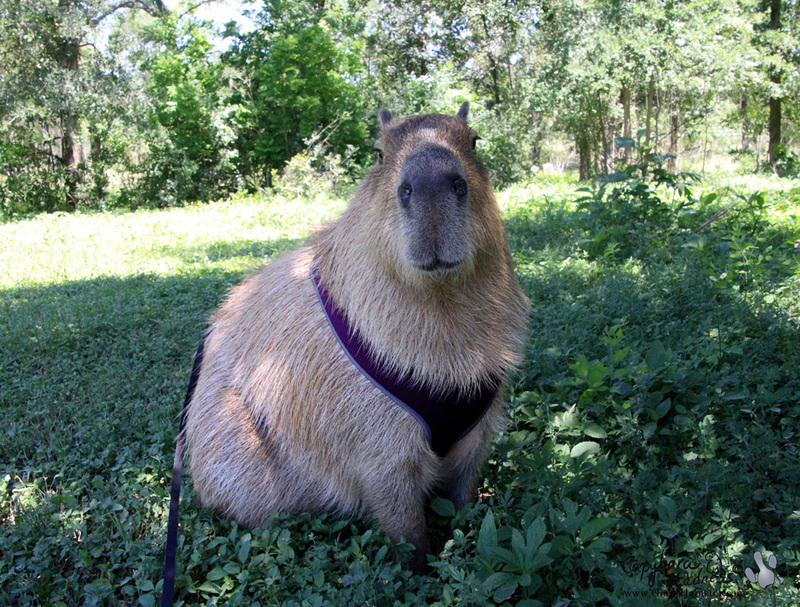 There’s something you should know about capybaras and harnesses, they don’t work on us. When I went through the brush, this is what happened to the harness. 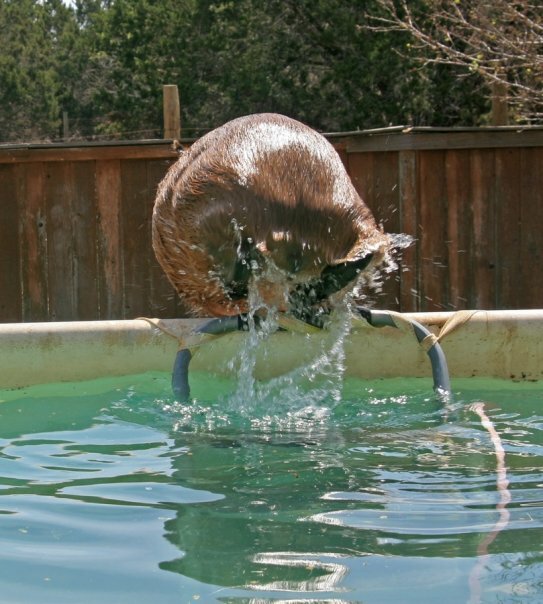 I don’t know why, but my little paw just slipped right through it. This is the very reason (among others) why I have to wear two harnesses. Is it my fault they slip off so easily? The good thing about my paw slipping through the harness is that when Melly pulled on it to try to stop me from going into the pond, it neatly slipped right off! Melly doesn’t seem happy about this for some reason but, if you ask me, it worked out great! Anyway, that is the story of my new harness. Not only do I like the color, but the mesh fabric is much more comfortable. I like the color and the collar. it does look a lot more comfortable. I don’t have this type but I know people who do and they love it. 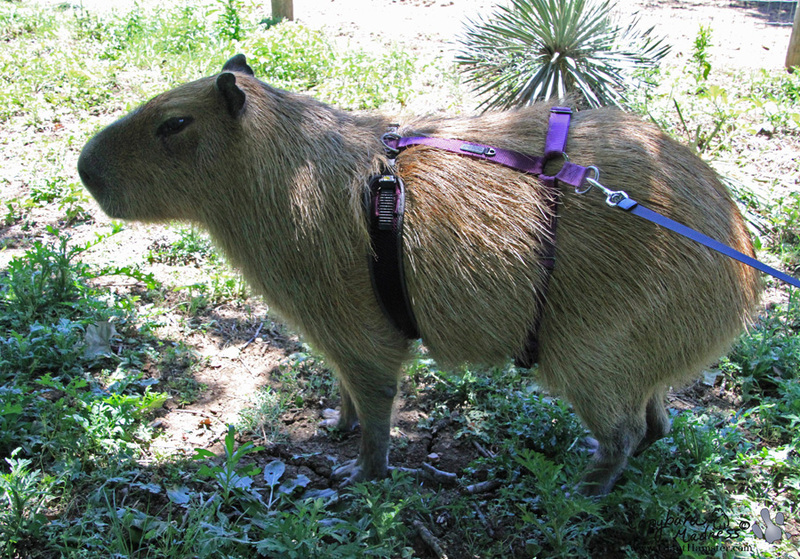 but as all harnesses, I see it’s not as effective on capybaras! you’ll get to try it out in public on Thursday! that’s exciting! Love you new harness. Purple is my favorite color too. My dogs slip their paws out of their harnesses too! 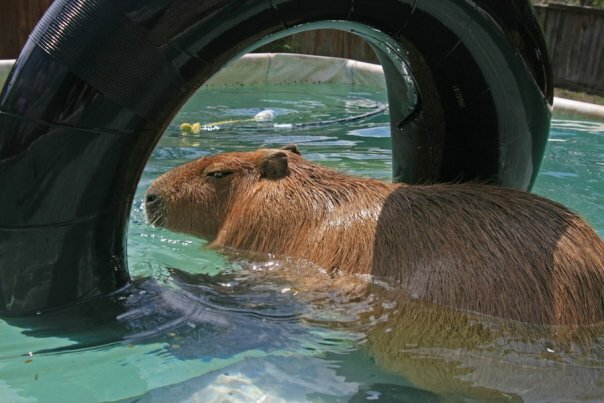 Capybaras and Corgis are problematic to contain. No neck + little legs = halter slippage. At least you’re pretty in purple! Purple is my favorite color. You look very regal! You shine in purple, so regal. OUTSTANDING Gari! I want to get one of those harnesses. I think it slips off even easier than mine! My old harness is muddy and it has some mysterious bite marks, but when it goes through the washing machine, it shrinks a little and that is very uncomfortable. This time of year I am in the mud daily, so what’s the point? Plus, it is marked up and is just approaching perfection! Maybe I’ll keep the old one for now. If I could wear a harness I would want a nice purple one like that! Purple is a VERY royal color! Good thing you marked your new harness. 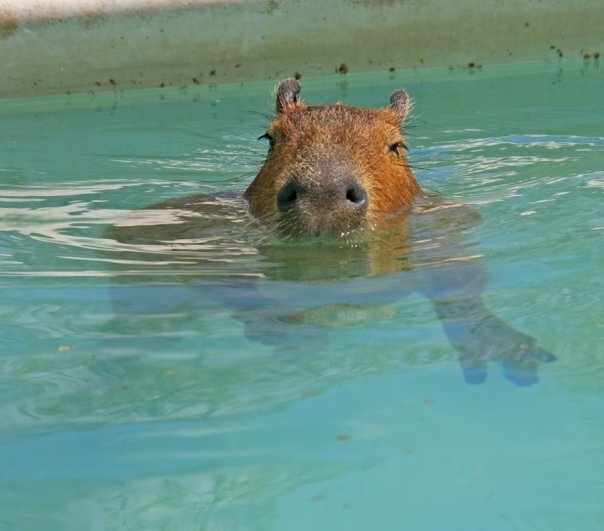 You wouldn’t want some other capybara using it. I have always used a harness with my dog, who is quite a great escape artist. However hers is not as fancy as yours and the leash is red—her favorite color. Like you, she wants her things marked too. 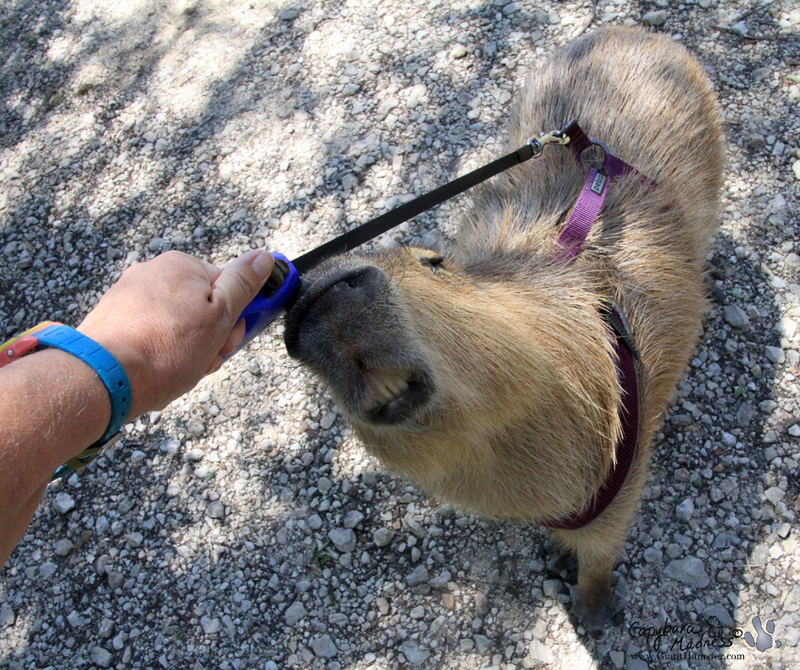 Maybe dogs and capybaras DO like some of the same things? Good luck with your harness. The color purple suits you perfectly. Beautiful color and perfect how it slips off for you just when you need it to. Most importantly — it’s your color — makes you look regal indeed! Mark on! What a coinkidink! I just purchased a purple harness for one of my basset hounds…I had previously gotten her a nice mesh harness because she kept slipping out of her collar (backing out) and going for a neighborhood romp! Well, she slipped out of this too! Now I had to buy her a “step-in” harness and hopefully she will not slip out of it! 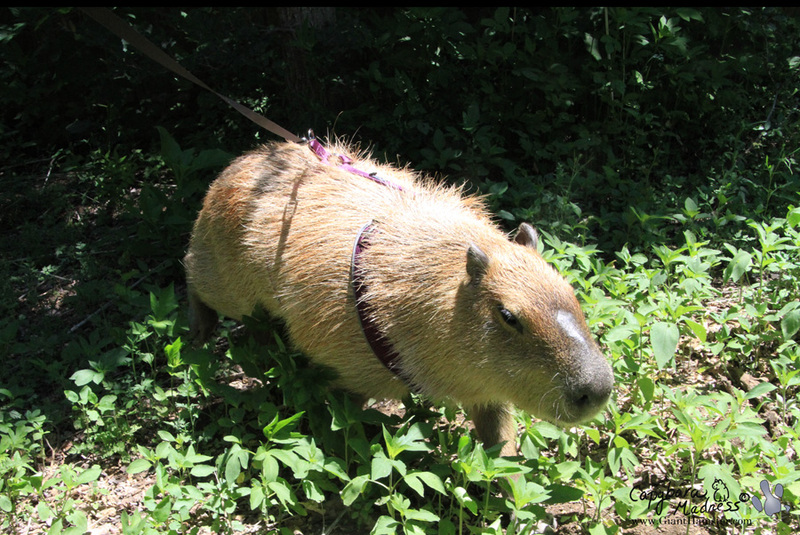 Capybaras and basset hounds look great in purple! 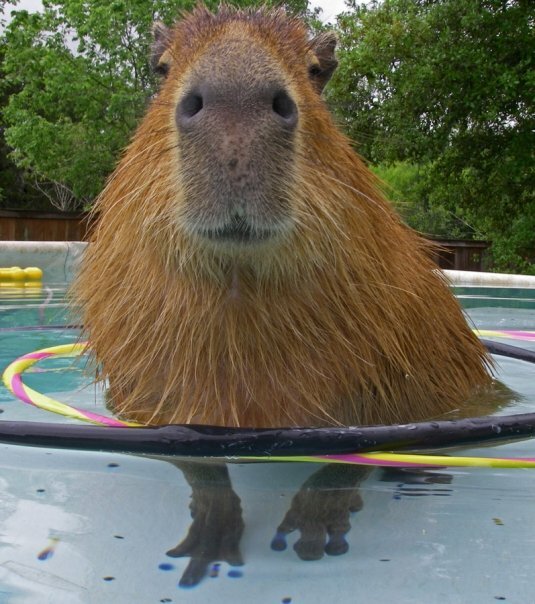 Gari, you are so handsome and I want to give you kisses like I doo my guinea pig Butternut….who kind of resembles you. Love the royal harness! 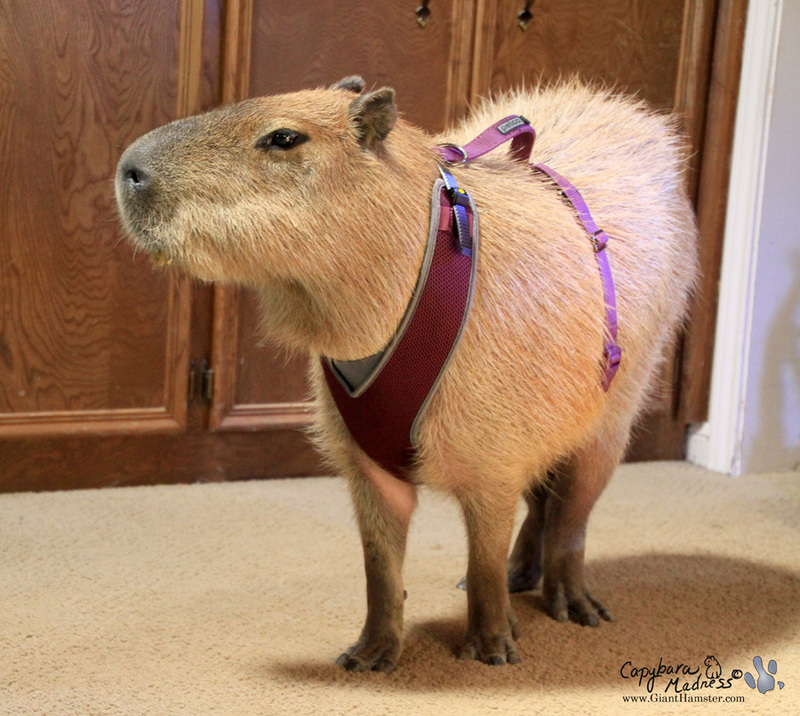 A wonderful harness for a wonderful Capy. I would save this one for “appearances” so it keeps it nicer for longer without getting worn. It is an amazing vibrant colour and looks fantastic. 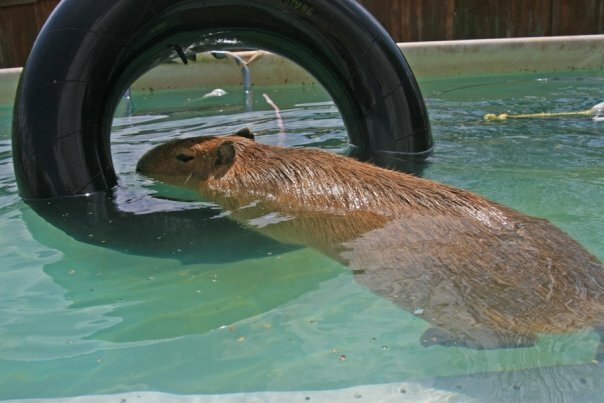 I am sorry to tell you that Ohio recently changed its laws governing the keeping of exotic pets. 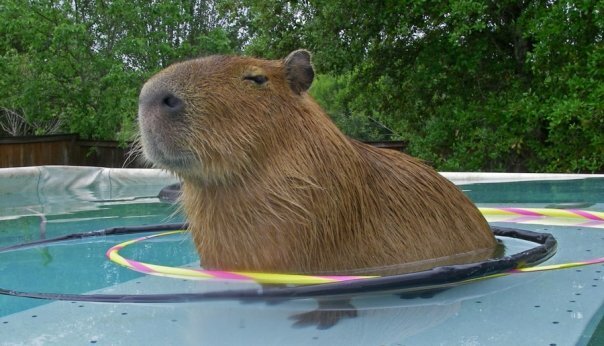 I don’t think you can keep a capybara in Ohio anymore. 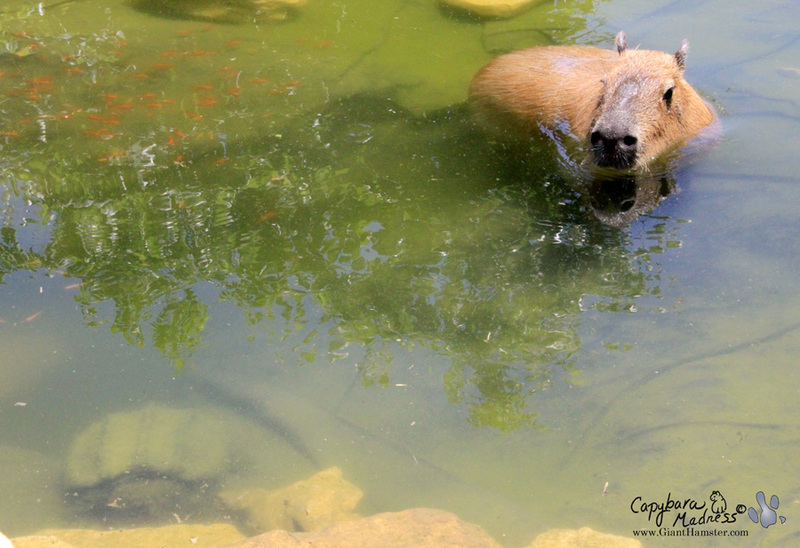 At any rate, capybaras are fairly long lived and, being 11, I don’t think you are in a position in your life to make the required commitment. It is absolutely beautiful and you look very regal!!!! The water in the pond looks so refreshing. I am sure you had a wonderful time! Hee Hee you are so cute. Love that purple harness. You are royalty now for sure.